The area roads are looking good…well except for the dirt roads…they are a tad messy. We are in some kind of Winter Storm Watch, they keep changing the forecast so who really knows what will happen…rain, sleet or snow and how much of each. I guess you never really know what life will toss your way. Yesterday we headed to Moorhead for a benefit for long time friends Lynne and Jim. They are both amputees. Nice to see so much support in the community for our old friends. Their children had the benefit to help out with medical expenses and to make their home more handicap accessible. Jim lost his leg years ago to a staph infection in the bone and recently has had a multitude of health problems, Lynne lost a valiant fight through 14 surgeries to save her leg after a fall from a chair. (She was reaching up to hang a plant on a hook and fell.) Between them they have two left legs…or two legs left. Both still have a sense of humor. It was a nice day for a Sunday drive. Chance enjoyed a game of ball along the way. We returned home to some mud and brown. My guess is that March will go out just like it came in…miserable. March 1st it was –40 F wind chills. March 1st I made some goals for the month. I hope to work out the kinks in a new Christmas ornament design…and then decide if it is possible to do 65 70 of them. R & D is complete, it is possible. I have purchased the paint and the string to use for hangers and Far Guy is cutting out the rough shapes and we have begun carving them. Each ornament has six pieces so it is no easy project. We are starting early enough that we should be able to complete them in plenty of time and perhaps even sell a few…in my humble opinion they are beautiful and will be hard to top next year. Finish the afghan I started as a 2013 Christmas Gift for Jen. In progress. I ran out of yarn, purchased another skein of yarn and it is the wrong color…darn florescent lights anyway. Have the annual snow stick contest on the blog. The carvings are done. Just waiting for the snow to melt at the snow stick! Work on Far Guy Military Scrapbook…it has been on my desk since New Years. My part is completed, everything is in the scrapbook, he still needs to write down some memories before he can’t remember. It felt so good to get it off my desk!!! Yeah me!!! I am not sure what goals I will set for April…time will tell. Jen was going to a conference so I went along and helped drive and watch traffic. We were gone about 31 hours. We stayed in a fancy smancy hotel on the 15th floor. I calculated how many sheets we would have to tie together in case of fire and we didn’t have enough in our room…then I noticed they had a sprinkler system and there was a ledge not too far out the window where we could have sat waiting for a ladder truck. The next morning I couldn’t figure out which direction was which, I was looking out the window across the city feeling really lost…which way was home? Jen showed me on her I pad which way was north…I would never have guessed. There wasn’t any moss on the trees to give me a hint of a direction…but we did see a Robin…my first of the year. We had breakfast in the hotel. Out of a box eggs…I think perhaps they have lost the appreciation for a real egg. The delicious poppy seed muffin almost made up for the rubbery eggs. They must have an awesome pastry chef on staff. This was the food art in the dining room. I was going to have an adventure taking the bus…but Jen was certain I would get hopelessly lost, so she drove me to an old friends house that was just 15 minutes from the hotel. Far Guy and Chance survived their time alone. Chance thought I smelled awfully interesting when I returned home after a long day of playing with other dogs. My old friend has two Standard Poodles. I have never been particularly fond of Poodles after living next to a few yappy little ones years ago. These two boys were fun and interesting to watch. Since their Mom was working half of a day from home..we had lots of time to get to know each other! We became fast friends! One thing I will say is that their coats were a pleasure to stroke..so soft almost like down. This is Kirby, he is a real gentleman. Both dogs are respectful of your space and listen to commands. No bark, sit, stay, come and enough! They have been to a few classes. Stanlee is the younger of the two dogs. He has lots of energy and is attached to that ball! He is even more ball obsessed than Chance. It was good to get back home. I am not certain how people can enjoy living in the big city, I appreciate the quiet non traffic life in the country. I wonder if this winter will ever end? It seems like it has been a extra long one. Looking back on my blog our first snow was October 20 2013. That was 160 days ago. Yes I can do math..160 days of winter and counting…old man winter doesn’t want to relinquish his icy grip. Many of the homes and businesses in town have frozen water lines and frozen sewer lines. Far Guy has taken to measuring the temperature of our water every day. It has been hovering around 42 degrees and made a jump yesterday to 43 degrees. (Heat wave!) If it nears 35 degrees you are in danger of freezing up. Knock on wood we have been lucky to have water and sewer all winter. If it hadn’t been so freaking cold for so long we wouldn’t have to worry…but the frost went way into the ground this year. In town some alleys and streets are littered with hoses running here and there and some people have been instructed to leave their water running 24 hours a day. The Post Office in town has a Porta Potty out back. I want to see green and color so I run to my photo archives. Unfrozen water and green grass. Seems like a memory of long ago. Spirit Lake August 2013, the sun was brutal that day and it was about 98 degrees in the shade, with about as much humidity. I don’t like it quite that warm but I will take 75 degrees any day of the week. When you grow up on a farm, town is a long ways away. Other than going to school on the bus, we went to town once or twice a month for groceries. The ice skating rink was in town. On our farm there was a low spot in the corner of the field on the south side of the driveway. If there was a early spring thaw and then a cold snap the water would collect in that corner of the field and freeze. It made for a wonderful place to ice skate. This spot in a nearby field reminded me of Saturday afternoons in the spring. Remember those double runner skates that you strapped onto your boots…sometimes they came undone and you would fall down. We would put our skates on in the house and then tromp to the ice…either that or take a couple of pieces of wood to sit on to put on our skates in the field. Round and round we would go skating faster and faster, cheeks rosy red, scarves trailing in the wind until we hit weeds coming up out the the ice…that would slow you down. Soon we were tired and still had to change into our now cold boots or walk all the way back to the house in our skates. As a farm kid, I never knew about skate sharpening. When we were lucky enough to get ice skates they were never sharpened, they were what they were and sometimes you just had to make your own fun. We still have winter here, it has been below zero again. –13 F one morning that is –25 C eh. Somewhere about 10 1/ 2 to 11 inches of snow remains at the snow stick. Harriet asked about Bullhead that I mentioned yesterday. We have a fish here in Minnesota called a Bullhead. Technically it is a Catfish…but we call them Bullheads. Here is a link to some photos at the MN DNR site. Bullheads have spines near their fins. Along the shore of Shell Lake when my baby brother stepped on a dead bullhead one of those spines penetrated his foot, and he got an infection which lead to blood poisoning, which lead to me waiting on him hand and foot. He was only allowed up to go to the bathroom. His foot was elevated in a plastic bag to draw out the poison. Bullheads are not normally a fish that you “fish” for, but some people eat them. I like Catfish…I consider it a good tasting fish…but I usually buy farm raised Catfish at the grocery store. If I could I would march right into a Captain D’s Restaurant and order up some catfish and some hush puppies. Then I would head to Richard’s Patio south of Lafayette Louisiana and order up some Crawfish, then to D and B Gumbo in Gulfport Mississippi for some Gumbo, then to the NCO Club at Tyndall AFB in Florida to order some lobster. Seafood Road Trip!! Side effect… weird dreams for a few nights! Seafood always makes me dream how about you? My baby brother is sixty today! Happy Birthday Carey! This is Carey and I in 1954, see how supportive I am of him, making sure he doesn’t fall over in the grass. I don’t have many pictures of him on his birthday but I have just a few on my own birthday! Here I am holding the cupcakes and he holds my doll…probably what makes him such a good Dad and Grandpa. In 1957 I would have been six and he was three. I am possibly the best older sister he has! “Fraidy cat…fraidy cat” Am not. I am a fraidy dog! WELL…wind…I shoulda been a prairie dog. “REALLY?” No, not that kind of Prairie Dog a dog that lives in a real house on the prairie with you and Far Guy. “BUT we live in the woods.” Yes… I know that, where leaves and twigs and all kinds of stuff falls from the skies. And now there are the daggers of danger. I knew what you were doing when you ordered me inside, I heard them come crashing down. I am a Border Collie after all. You thought you could fool me, or at the least save me from being impaled. It seems there are ice daggers everywhere. The rough ice hurts my paws. I can only play ball for a short time. Then I hobble over to the door and drop the ball. Someone said I was “Pathetic.” I also have to be accompanied outside to do my business…mostly at night on account of skunks. It is cold and windy here, all the mud is frozen solid, there are ice rinks all over the yard and ice daggers hang from all the eaves…except the ones that Far Side hit with her broom. In days past Monday was wash day. I used to have the dish towels that proved it...I could count on taking Tuesday off because that is ironing day and Wednesday too as that is sewing day. Yes I wash on Mondays, but then I wash on others days too cause I don’t have to heat water and lug it to the washer or use that wringer. This is a wringer stand that has a wash tub on both sides. This wringer was adjusted by the knobs at the top and you provided the power by turning that handle. A wringer was why ironing day followed wash days…they made terrible wrinkles in clothing. My Mothers wringer washer was like this one minus the sign. Electric it was. With lots of warnings that you didn’t want to get any body parts going through the wringer. We had an old soaking stick that we would use to fish the clothing up out of the washer with…it was all slimy and soft on the pokey end. We poked clothes up near the wringer and watched them get rung. When I was about 7 years old maybe 8 I have a very vivid memory. It was a sunny day and we were on a fairgrounds someplace in Southern Minnesota or Iowa, we were seated in the grandstand. We were watching some kind of show…there were clowns…running around acting clown like. At one point they wheeled out a wringer washer and one of the littlest clowns got stuck in the wringer and came out on the other side flat as a pancake. The crowd roared. Of course the child in me was traumatized by such an event and after that I was really really really careful around the wringer. I realized later as an adult that no one would fit in a wringer, it was some slight of washer trick. Perhaps it was revealed at the time..but I had my eyes closed tight. Now..does anyone else remember this slight of washer trick? Shortly before my other baby brother was born in 1960 my Mother got a fancy smancy washer with a spin dry compartment. I was so relieved not to have to worry about that wringer anymore. Recently we had a chance to stop by the Arago corner and take a photo of the historical marker there. In 1843,the explorer Joseph N. Nicollet named a nearby lake Arago in honor of Dominique Francois Arago, a celebrated French astronomer. Fifty years later, the name was given to the township surrounding this area. At the turn of the century the Fairview Hotel and Arago Post Office stood in this vicinity. Settlers here worked in the logging camps, operated sawmills grew crops and were relatively self sufficient. After Itasca State Park was established in 1891 a stagecoach made regular trips from Park Rapids to the Itasca Post Office, stopping to rest and change horses at Arago and the place became a stopover for travelers. US highway 71 in this area coincides with the Jefferson Highway, dedicated in 1919. The collection of roads and trails meandered through the land area known as “The Louisiana Purchase,” acquired when Thomas Jefferson was President. The visionaries of 1915 who committed to building this 2,300 mile highway included a delegation from Winnipeg, Manitoba, who convinced the Americans to make their city the northern origin of the Pine To Palm Highway. The other end and ultimate destination was New Orleans, Louisiana. I think this marker is maintained by The Scenic Byways Association, there are maps of the Jefferson Highway, information and a place for comment cards. While I was the curator at the Historical Museum there was a program about this highway. They are having a huge “to do” in Park Rapids this spring all about the Jefferson Highway. The Jefferson Highway is also called The Pine to Palm or the Blue Road. It’s counterpart is the east and west Red Road or The Lincoln Highway which spans from Time’s Square in New York City to Lincoln Park in San Francisco. The Red Road was dedicated in 1913. Some of the Jefferson Highway enthusiasts are painting JH on a white field with blue bands on power poles. Others just did their own thing like this small wooden sign at the Arago Cemetery which is just south of the historical marker. We like to stop at all the historical markers we come across, sometimes we don’t have time to stop, but we always enjoy a bit of history when we do. As soon as I complain about the state of brown we are in it turns cold and snows and makes our world white again. Yesterdays muddy driveway is now white. Oh well this will melt someday. It snowed about 2 inches but it settled quickly. The snow stick is at 11 inches and holding. We waited for the main highway to clear off before heading to town to do errands. Far Guy special ordered some saw blades and I had “stuff” to drop off all over town. Organizing and selling off “stuff” is going well. I read an article recently about organizing during Lent it was called Forty Bags or some such thing…the whole idea being that if you took one bag of “stuff” out of the house every day at the end of forty days you would notice a difference. I haven’t kept track of my bags…but by Easter I may notice a difference. From the looks of the weather it looks like I have lots of time to while away before spring arrives for real. I am not inspired by the brown world out there, none of the brownness excites me to take photographs. I wore my red plastic boots outside and played in the mud with Chance. I took him over to a snowy area to get cleaned off. We lost a couple of balls. We watched the birds and listened for sounds of spring. We still have our usual year round birds. Nuthatches, Chickadees and Woodpeckers. The snow stick stands at about 10 inches. Far Guy and one of his friends went woodcarving yesterday to a shop in Moorhead Minnesota. They wanted to visit and see what was happening at Larry’s. Thursdays is open carving there. Several Retired Air Guard guys are carving there so Far Guy had a good visit. Chance and I spent the day doing odd ball stuff that never shows and playing in the mud. Chance was certain that Far Guy was never coming back…he is so pathetic sometimes. See how sad he looks? I hope to work out the kinks in a new Christmas ornament design…and then decide if it is possible to do 65 of them. R & D is complete, it is possible. I have purchased the paint and the string to use for hangers and Far Guy is cutting out the rough shapes and we have begun carving them. Each ornament has six pieces so it is no easy project. We are starting early enough that we should be able to complete them in plenty of time and perhaps even sell a few…in my humble opinion they are beautiful and will be hard to top next year. Finish the afghan I started as a 2013 Christmas Gift for Jen. In progress but not yet done. Work on Far Guy Military Scrapbook…it has been on my desk since New Years. It is still on my desk. The Income Taxes have been completed and electronically filed. The refund we get back will be spent all in one place…doesn’t take long to spend nine dollars. I am still working on transcribing Far Guys Grandparent’s Farm Diaries it is slow going. We had one exciting night out at the neighbors playing cards! It was good to look at a different four walls. Jen went on a Spring Vacation to Miami and brought us back a bit of summer. My Mom made Far Guy a Chance inspired table runner and place mats to match. Blog reader Dale spent some of his quiet time this winter after two surgeries woodburning Chance’s likeness into some wood. Thanks Dale! Our other spring gift is mud. Yes we still have snow, but it is melting and making mud. Dogs, each and everyone has captured our hearts. All have been one of a kind. Muggy came after Tiny in Far Guys family. Here he is dressed in a sweater sitting next to the most coveted spot in the house. That heat register was a spot where my sister in law camped out and also my children. They would grab their blankets and hog all the heat coming out of that register. I am not sure who bought this sweater for Muggy but it hung on the back porch for a long time after he died. 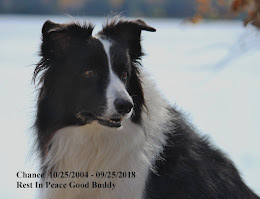 He had a good long life, what could be better than for a dog to keep you company and on your toes for many years and then succumb to old age. The last time I saw Muggy I scratched his ears…his mind was gone and his body was failing and it was time to say goodbye. I think my father in law sat by the cardboard box lined with blankets and towels that was Muggy’s home for days before the end came. How do you sum up the good life of a dog? Far Guy remembers how Muggy slept next to him with his head across his neck. He was Far Guys Dad’s dog and was very protective of him…if you walked by and slapped him on the knee the dog would go ballistic. The time he pooped on my foot during a very formal dinner. How he loved to bare his teeth and growl at me and chase me from chair to chair yapping his head off. The story about Ray coming to the door and making the mistake of opening the door to the kitchen…Muggy lept as far as he could and hung on. Muggy was sent to the basement the day we got married because the house was full of company. He ripped out a toe nail and bled all over the basement..everyone was late getting to the church. He was happy being tied out to the clothesline where he could run back and forth and bark. He always wore a harness. He was a tad gassy and could clear a room, and also became the scape goat for anyone else with a little gas…blame it on the dog. No, he could not jump up on a chair by himself…someone who shall remain nameless helped him. Muggy was a Chihuahua, very spoiled, much loved and much missed after he was gone. Have you ever seen a SnoBear? I had not. So when I saw one in a parking lot, I naturally had to get a photo. I wondered what does a SnoBear do anyways? I wondered if it was some kind of snow machine that gave elderly citizens a chance to get out on the trails. It was heated or appeared to be. I wondered how many people could have a ride at once. My wondering was interrupted by the owner, he said “I bet you have never seen one like this before?” No I had not. I made my guess and he laughed. Turns out he is from the little village of Eagle Bend and purchased this vehicle second hand. He asked if I would like to see inside? Well of course I would! He was a very nice gentleman, either that or he was used to old lady gawkers with cameras. It is a fish house, he had been fishing over on Leech Lake. This vehicle/fancy fish house is on a track and it can raise and lower itself by 14 inches. Some models have bunks, so you can catch a nap or fish all night! I didn’t see bunks in this one, it had two captains chairs. He was off to a new fishing spot! Minnesota’s winters are way too long for many people. Happy St. Urho’s Day 2014!